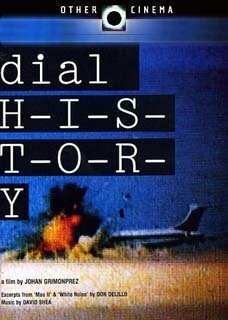 Buckle up for DIAL H-I-S-T-O-R-Y, the acclaimed hijacking documentary that eerily foreshadowed 9/11. We meet the romantic skyjackers who fought their revolutions and won airtime on the passenger planes of the 1960\'s and 1970Õs. By the 1990\'s, such chara Buckle up for DIAL H-I-S-T-O-R-Y, the acclaimed hijacking documentary that eerily foreshadowed 9/11. We meet the romantic skyjackers who fought their revolutions and won airtime on the passenger planes of the 1960's and 1970Õs. By the 1990's, such characters were apparently no more, replaced on our TV screens by stories of anonymous bombs in suitcases. Director Johan Grimonprez investigates the politics behind this change, at the same time unwrapping our own complicity in the urge for ultimate disaster. Playing on Don DeLillo's riff in his novel Mao II: "what terrorists gain, novelists lose" and "home is a failed idea", he blends archival footage of hijackings with surreal and banal themes, including fast food, pet statistics, disco, and his quirky home movies. David Shea composed the superb soundtrack to this free fall through history, best described in the words of one hijacked Pepsi executive as "running the gamut of many emotions, from surprise to shock to fear, to joy, to laughter, and then again, fear." "Exceptional for its juice, its jazzy compelling fusion of social and aesthetic issues, and its stomach-churning power." "A sense of urgency and a wrenching emotional attack." "Each cut turns a screw deeper until your mind hurts." "An eccentric, roller coaster ride through history." * Booklet with director Grimonprez interview on the politics of the Spectacle. * Subtitles in Japanese, French, Dutch, German, Spanish, Portuguese, and Galician. Japanese, French, Dutch, German, Spanish, Portuguese, and Galician.